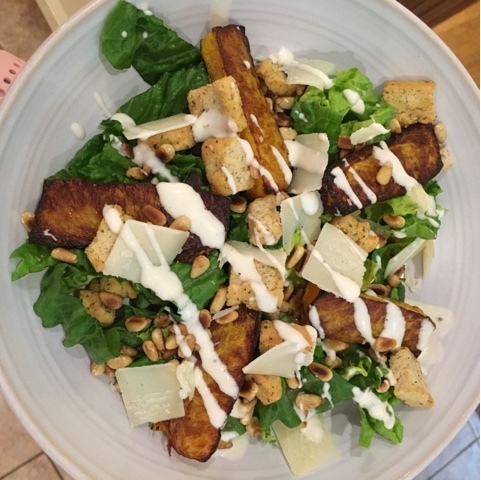 Trying to healthy up our weekday meals a bit so The Hubs is having Ceasar salad quite regularly, I know it sounds a bit weird but I quite like to eat the same meal as him but a veggie form so I came up with this salad and it's absolutely delicious! 1. Peel the butternut squash and cut the top part into thick sticks (cut up the rest and cook for another meal!) drizzle with olive oil and roast for 20-30 minutes. 2. In a dry frying pan gently toast the pinenuts until lightly browned. 3. Cut up the lettuce and place on a dish, place the roasted butternut on top, sprinkle with the croutons. Add some Parmesan shavings and drizzle over some Caesar dressing, finally top with pinenuts. Like this post? You can see all our family friendly meals here. 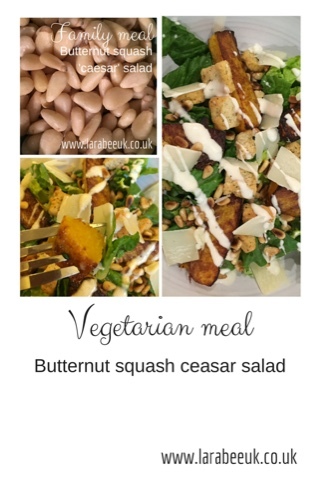 butternut squash is one of my favourite veg to put in so many dishes- never thought of using it this way too! What a coincidence! I bought butternut squash this week, wasn't really sure what to do with it yet and now I know ;) Perfect! That looks lush! 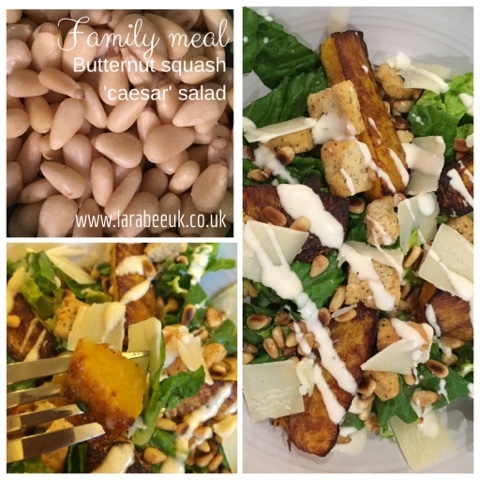 I've never thought to try ceasar salad with anything different and I love butternut squash! That is such a lovely sounding recipe. I love butternut squash and it is so good for you. Definitely is a healthy choice, it's funny as my husband always says 'I can't believe there's no meat in that' whenever we have something full veg :) looks good and will be sure to try it out. This looks yummy. Definitely going to try this. I love Caesar salad, such a perfect lunch option for summer. I've only ever had butternut squash in soup before, I'll have to try it this way.